Small Business Saturday in Basingstoke this weekend! Shoppers are being encouraged to love the local and independent businesses in Basingstoke this weekend to celebrate the UK-wide initiative, Small Business Saturday. Small Business Saturday, which takes place on Saturday 1 December, is a national celebration of the smaller and independent shops which line the UK’s high streets. Basingstoke is home to a diverse selection of shops for different and unique Christmas gifts and restaurants to take a break from the shopping frenzy. Small Business Saturday is largely viewed as the antidote to Black Friday and Cyber Monday, which is dominated by the big brands. An estimated £748 million was spent on Small Business Saturday last year, making it the most successful year so far. It also has the support of growing number of local authorities, with 87% pledging their support last year. * However, Small Business Saturday still lags behind Black Friday, as we reportedly spent £7 billion during last week’s buying blitz. 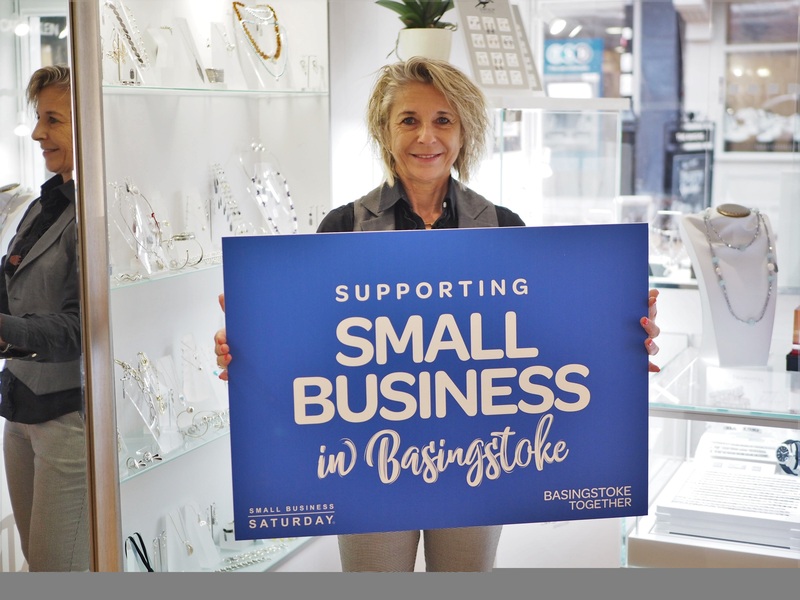 ** Basingstoke Together, the public face of the Basingstoke BID, wants more people to embrace the town centre independents, particularly in the Top of Town, to recognise its potential as a vibrant shopping hub. To celebrate Small Business Saturday, Basingstoke Together have created a series of short videos to put small businesses in the town under the spotlight to showcase their products and services. 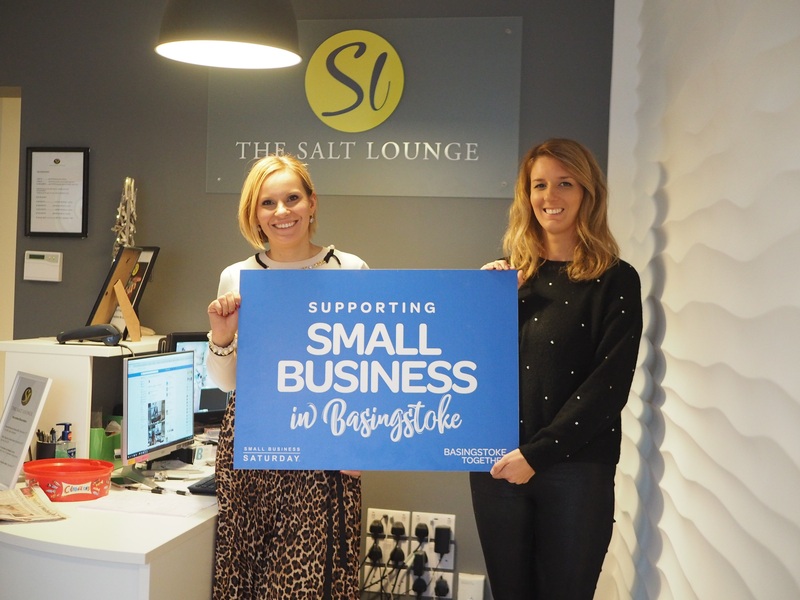 Independent businesses in Basingstoke have also been provided with printed hessian bags reading ‘I supported a small business in Basingstoke’ to gift to customers free of charge with any purchase. 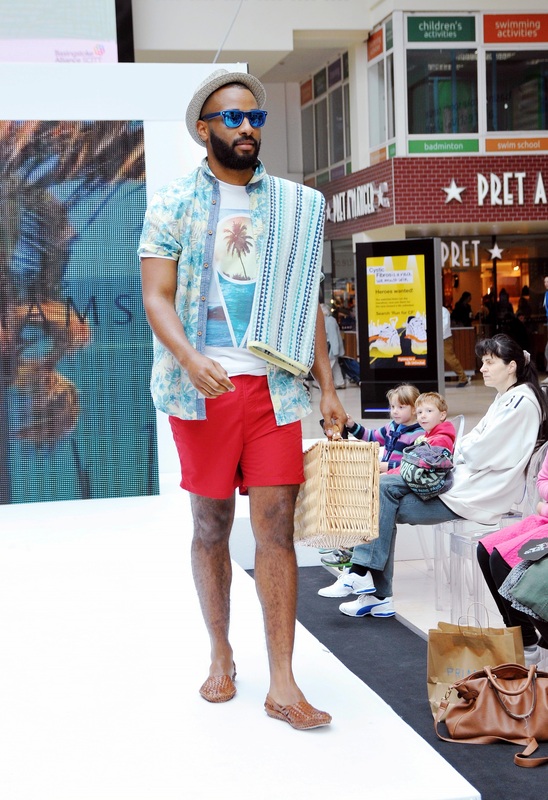 Lucy Boazman, Chief Executive of Basingstoke Together, said: “We’re lucky to have some fantastic national chains in Basingstoke, particularly in Festival Place and The Malls. But, a stone’s throw away at the top of town is the home to shops and businesses which you simply won’t find anywhere else. We hope that people in Basingstoke will support our independent and small businesses in the town centre as they do their Christmas shopping this weekend as well as in the future. Basingstoke Together aims to help the town centre to thrive by creating destination events, engaging with consumers and supporting retailers and businesses. 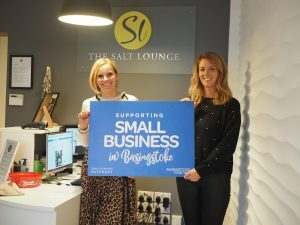 It will soon be launching a campaign to develop a regional community of Basingstoke’s small businesses. 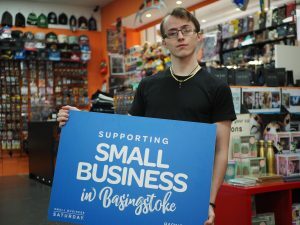 As part of the campaign, independents in Basingstoke can display posters and window stickers, share their stories on social media using the #BIndependent hashtag. 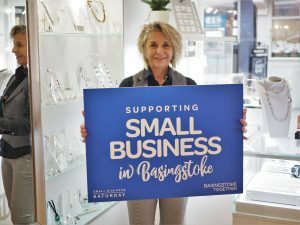 Basingstoke Together also offers free training with small businesses in Basingstoke on how to support growth in the town. 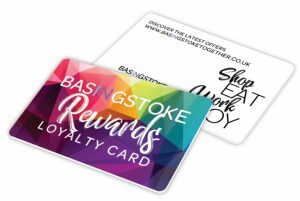 Basingstoke Together supports local businesses by creating cultural hotspots within the town centre to draw visitors into the town and promote the business and leisure opportunities on the doorstep. Basingstoke is a BID – a Business Improvement District, which is a business-led and business funded body formed to improve a defined commercial area. The improvements made by a BID are determined by the businesses themselves. It may include additional cleaning, security or projects such as recycling and improved infrastructure as well as destination branding and promotion. Schools, colleges and PTAs are being offered free sessions at trampoline park Flip Out at Festival Place, Basingstoke, to help beat the Back to School blues. Flip Out at Festival Place is giving away 10,000 free children’s jump passes, with each organisation able to claim 100 free tickets. The passes can be used for a one-hour session at any time Monday to Friday during term time, until the end of November. The initiative from Flip Out underlines Festival Place’s offer as a family shopping and leisure destination. 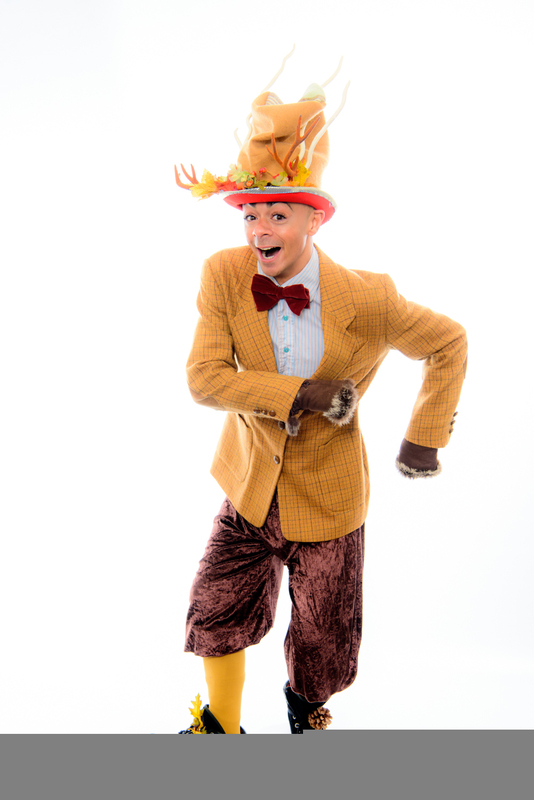 Neil Churchill, Centre Director at Festival Place, said: “We pride ourselves on offering fun for families and young people and are delighted to support Flip Out as it donates these free passes. One pass is permitted per user, who must be aged 18 or under and attending school or college. To take part in a session, a waiver must be completed and Flip Out socks must be purchased and used at £2 a pair. Children under 13 must be accompanied by an adult. To claim the free passes and for full terms and conditions, schools can call Flip Out on 01256 830803. 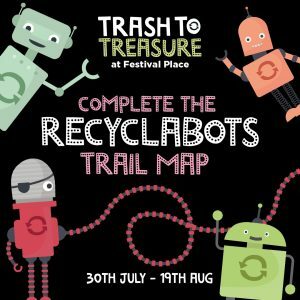 Trash will turn to treasure and plastic will become fantastic as Festival Place, Basingstoke, launches a major summer recycling initiative to encourage shoppers to have fun while playing their part in helping the environment. 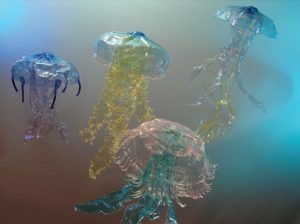 As part of the scheme, a series of eye-catching plastic “Recyclabots” – Maggie Zine, Alan Minium, Bev Ridge, Cap‘n Lidov, Carrie O’Bag, and Diana Thirst – will go on display around the centre to encourage shoppers to drop off their materials. There will also be a prominent plastics recycling drop-off point in Porchester Square from July 30 to start the campaign, which will run until August 19. The scheme will include an action-packed activities programme for families, including a “Robotrial” treasure hunt and a series of free craft activities from August 13 to 19 so children can create their own unique robots from the collected recycled materials. Schools and community groups are also being invited to build their own recycling robot. 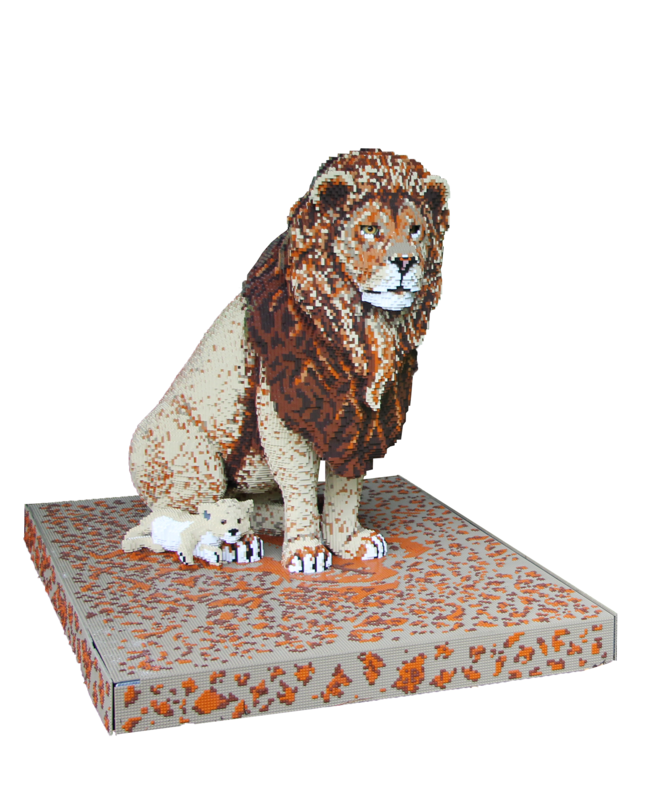 The sculptures, built out of anything from cardboard to plastic bottles, will go on display in the shopping centre. Shoppers will also be able to take part in an entertaining game called “Uppy Cuppy” – where they are challenged to hold up as many cups as they can. Participants will win a stylish and environmentally-friendly reusable cup. Members of the public will also be able to visit the “Carrie O’Bag” station to exchange their plastic bags for a brown paper reusable one. Shoppers will be invited to share all their artwork and photographs on social media using the hashtag #FPRecyclabot. 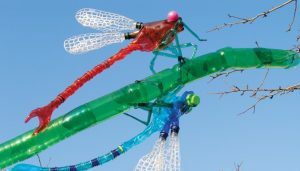 The initiative comes amid Festival Place’s ongoing commitment to help the environment and raise awareness. The shopping centre was the first in the UK to operate an on-site Materials Recovery Facility (MRF) and Food Digestion Facility, turning food waste into grey water that can be re-used. 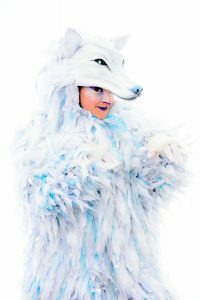 Emily Palmer, Marketing Manager at Festival Place, said: “Recycling and particularly the impact of plastic pollution is very high on the news agenda at the moment. With this in mind we have devised a summer initiative that aims to put the fun into recycling and particularly resonates with children. First shopping centre to operate an on-site Materials Recovery Facility (MRF) and Food Digestion Facility turning food waste into grey water. The centre recycles over 170 tonnes of glass bottles each year. All the centre’s cardboard and paper is recovered for recycling and it processes over 440 tonnes per year. Over the past decade the centre has been awarded three Green Hero and six Green Apple awards for recycling commitment. The centre uses waterless urinals and since 2011 collected rainwater has been used in the centre’s cleaning regime. Centre-wide initiatives such as putting timers on lights, swapping to green energy electrical suppliers, and reducing the temperature by one degree saves over 800 tonnes of carbon dioxide being released into the atmosphere each year. 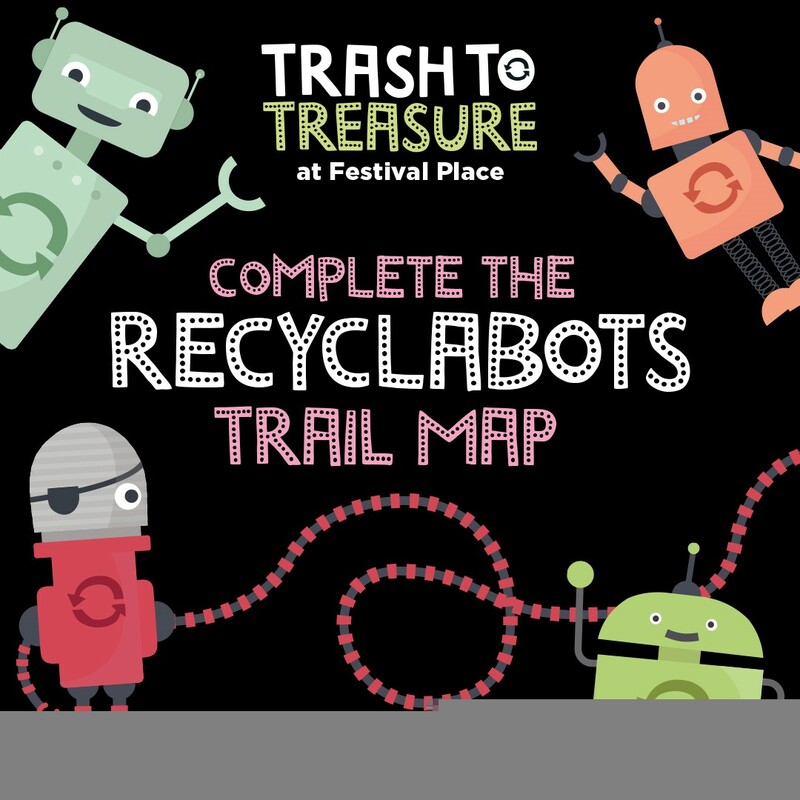 The Trash to Treasure campaign is one of a series of events scheduled at Festival Place during 2018. For further information visit www.festivalplace.co.uk or find details on Facebook, Twitter and Instagram. 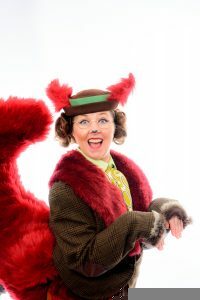 Thank you very much to Lottie for today’s NHM Review post!! Lottie and Louise (NHM) were invited along to try out Giraffe’s new menu and set up. We had a BRILLIANT evening and thank you VERY much to the Giraffe team for making our evening so lovely! 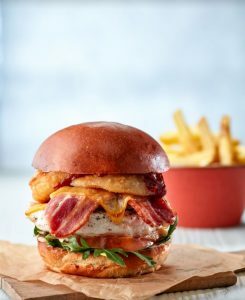 Giraffe in Festival Place, Basingstoke has recently had a bit of a makeover with new decor and a new set up where you now go up to order your food and pay when you order. 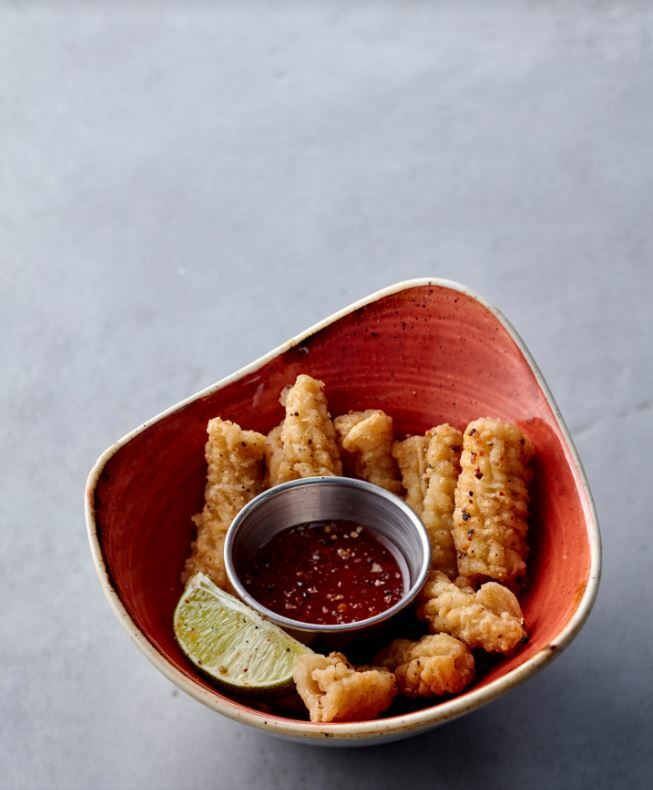 Recently, we were lucky enough to attend a tasting session at the new and improved Giraffe, where we got to try samples of meat and vegetarian dishes from the new menu. There is a large range of drinks to choose from on the menu including beer, wine, soft drinks, smoothies and cocktails. We were both driving, so we opted to try the ‘Homemade Lemonade’ (which is one of the unlimited soft drinks to choose from) and a mango and ginger ‘Nix and Kix’. I really enjoyed the lemonade and would definitely order it again. First up, we were given the ‘Roasted Harrisa Nuts’ and ‘Lovely Olives’ from the nibbles section of the menu. I don’t usually eat nuts but thought I would give them a try and was pleasantly surprised, I really liked them! 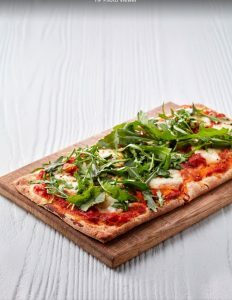 Being vegetarian, the ‘Garlic Flatbread’ was my favourite and would make a perfect sharing starter before your main course. the ‘Malaysian Laksa’ with tofu and prawns and the ‘Spiced Aubergine Tagine’, which was my favourite dish of the night! 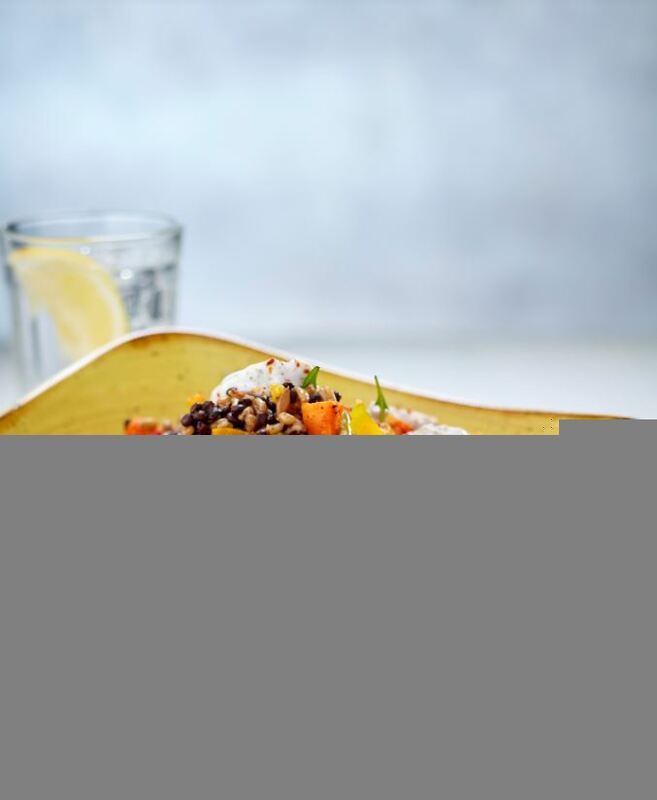 The tagine is a combination of charred aubergine, beans and lentils, and is served with cous cous, toasted flatbread and yoghurt. There is also a lamb version for those who prefer a ‘meatier’ option. Giraffes burgers are served in a soft bun with mixed leaves and a tomato slice, and they all come with skin-on fries. 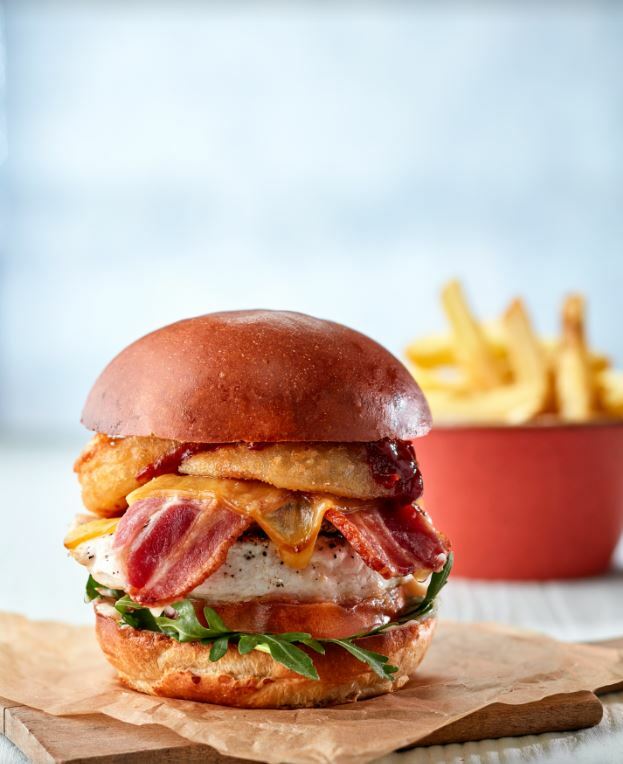 We got to try the Burger Bacon Cheese Stack and the ‘Halloumi and Falafel’ burger. Both were delicious, the sauce on the Burger Bacon Cheese stack was very tasty and anything that includes halloumi is good in my eyes! From the salad section of the menu we got to try the vegan ‘Super Freekah’ salad. 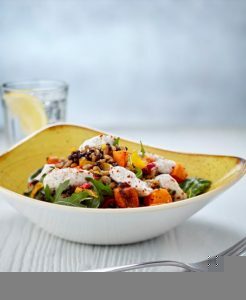 Made up of butternut squash, roasted peppers, lentils, freeka and topped with yogurt it makes a lovely healthy option. 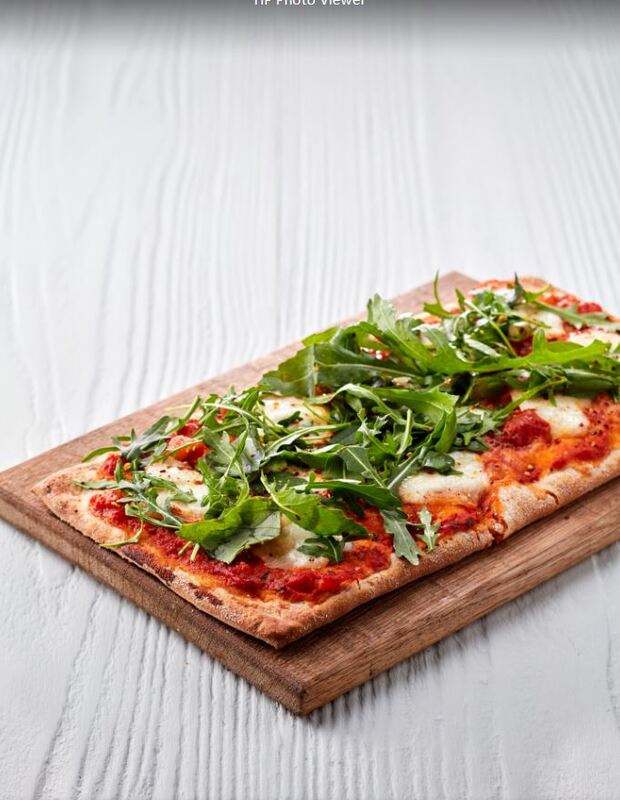 In addition to the ‘Garlic Flatbread’ starter, Giraffe’s menu has a range of flatbreads that you can also have as a main course. We got to sample the ‘Classic Margherita’ which was very tasty. The other flatbreads include ‘Mexican Chicken and Chorizo’ and ‘Spicy Pulled Pork’. 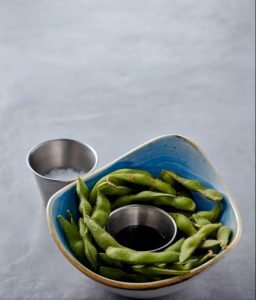 There are a variety of tasty sides available on the menu, including ‘Sweet Potato Fries’, ‘Creamy Slaw’ and ‘Chipotle Creamed Corn’. When it comes to deserts, Giraffe now offer ‘Unlimited Frozen Yoghurt’. We tried vanilla flavour and it was really good. 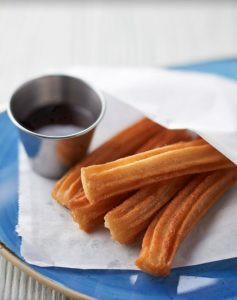 We were also lucky enough to sample the delicious ‘Churros’. 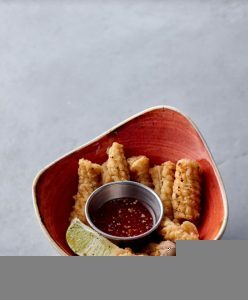 Churros are Spanish doughnuts, coated in cinnamon sugar and served with a chocolate dipping sauce. 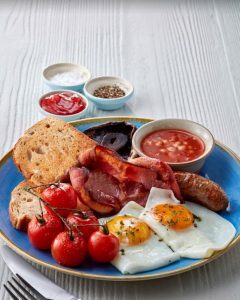 We didn’t get to try the breakfasts that they offer but they look yummy!!! With lots of wood, soft orange lighting and colourful furnishings there is a lovely warm and relaxed feeling in Giraffe. There’s music playing in the background which is loud enough for you to hear and enjoy, but not so loud that it disturbs your conversation. The new layout includes a counter for you to pay at and a section in the middle for self service of the unlimited drinks and frozen yoghurt. All the facilities were very clean and well looked after. With the majority of starters and deserts costing around the £5 mark and main courses roughly £10, I think Giraffe is great value for money. The Kids menu offers a huge range of meals – one of the biggest I’ve seen since having a child! 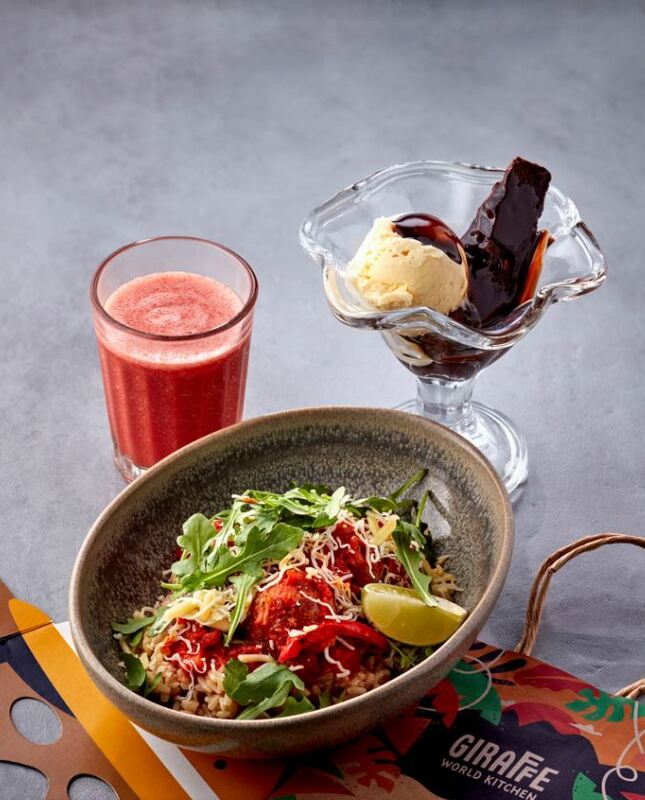 You can even get a great deal of a main, desert and drink for £6.50. 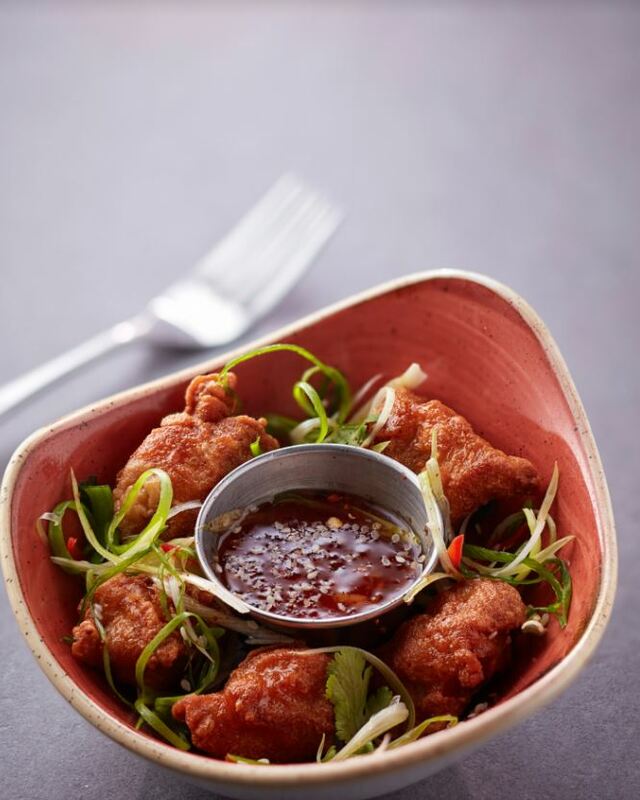 At weekends, they offer a free kids meal per full price adult main purchase! They also do a number of special offers, such as selected breakfasts for £5, 50% Flatbreads on Fridays and 2 for 1 on cocktails. 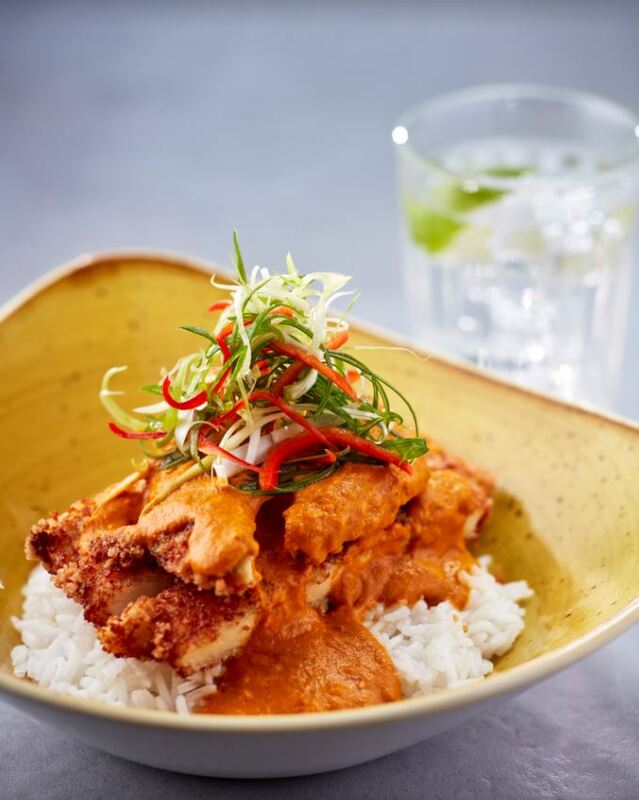 Having been to Giraffe in the past, I have always noticed the warm atmosphere and great variety on the menu. I was delighted to see this was still the case following the recent revamp and the changes to how you order your food. Thank you to Giraffe for having us, I will certainly be back soon! 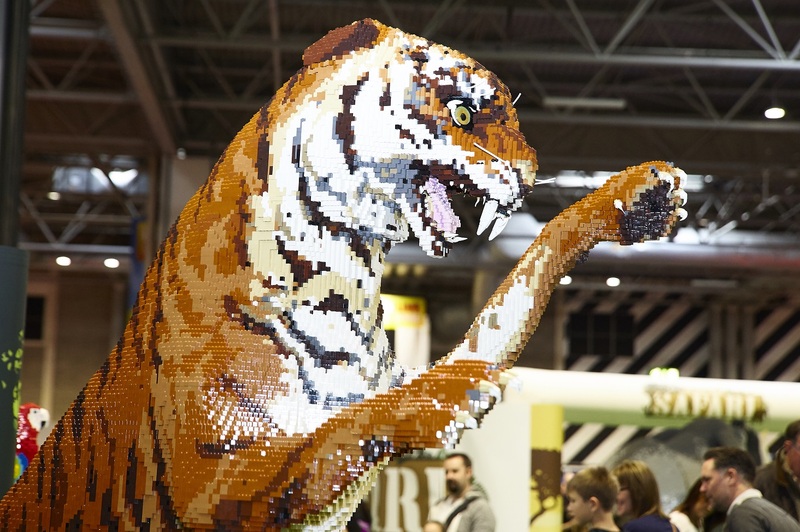 Disclaimer: This post is a review of Giraffe Basingstoke in conjunction with Festival Place. Our meal was supplied free of charge for the purposes of the review. We were not expected to write a positive review and any opinions expressed are our own. 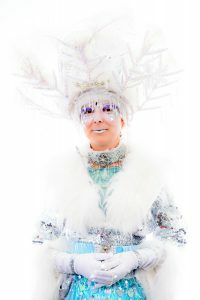 Christmas is now just around the corner and, once again, Festival Place has lots of exciting activities planned to delight and entertain the whole family. The season officially commences on Thursday 16th November with the ever-popular Christmas Light Switch-on, hosted this year by Matt and Michelle from Heart Breakfast. 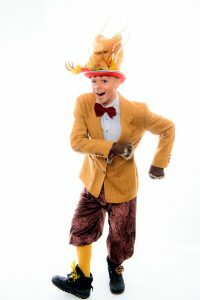 The evening will feature live entertainment from The Halo Glow Show – an explosive visual stage act featuring virtuoso circus artists; the Wonderful West End cast performing songs from The Lion King, plus the stars of the Anvil’s production of Peter Pan. Santa and his elves will carry out the ceremonial pushing of the ‘on’ button to light up Festival Place and visitors will also be able to enjoy a firework display and see the shopping centre’s brand new Christmas decorations. 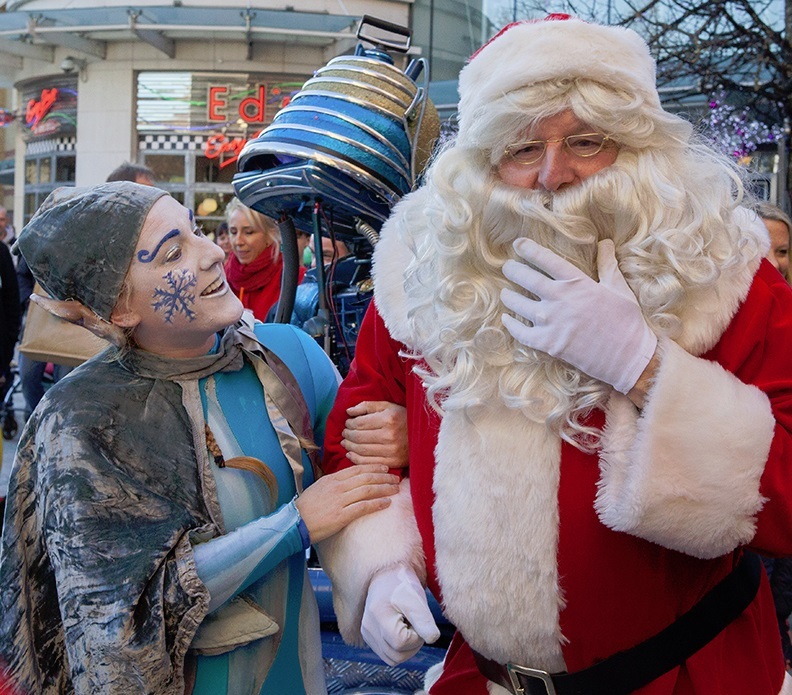 The famous Santa Parade will return on Sunday 3rd December at 12pm with Santa leading a whole host of Christmassy characters on a march from Porchester Square to Festival Square, sharing Christmas cheer with shoppers along the way. 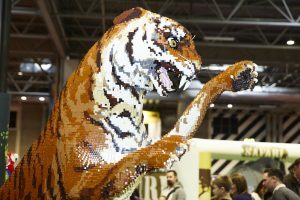 With over 200 big brands and plenty of restaurants and cafés to choose from, it’s easy to make this year’s Christmas shopping a fantastic family day out. Further activities are yet to be announced so keep an eye on the Festival Place website at www.festivalplace.co.uk/events or find them on Facebook, Twitter and Instagram.